We’ve only completed two weeks of college football and already some things that we thought we knew are being questioned. Who would have thought schools like Oregon State, UConn, Kansas State and South Florida would lose their openers to smaller FCS schools? And what about BYU? They go on the road to Virginia and lose 19-16, a game I thought they would win. The following week, at home, they rush for over 550 yards and beat Texas 40-21. Of course anyone who watched Texas last year shouldn’t be shocked that they can’t tackle anyone. Before the season began, everyone and his brother had South Carolina defensive end Jadeveon Clowney as the #1 overall draft pick. However, after two weeks, that theory is starting to be questioned. 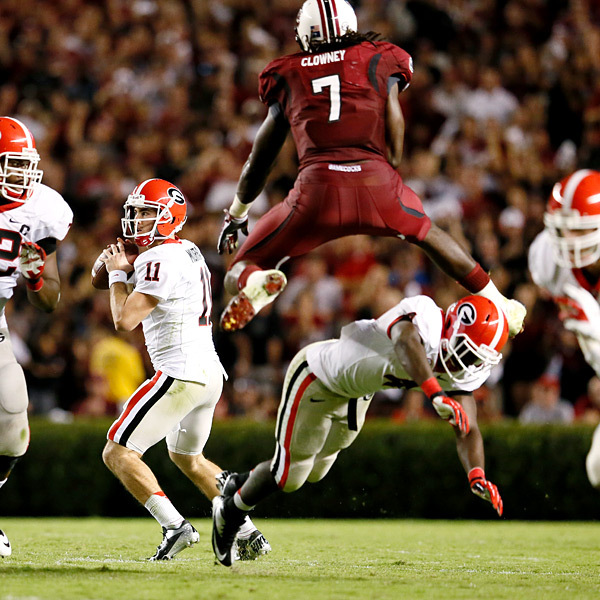 There is no denying Clowney’s ability and freakish athleticism. Lately, however, his conditioning and effort have been questioned. Clowney injured his shoulder during fall camp, but a couple of weeks before game one, Coach Steve Spurrier called out Clowney and two other players for not being on the practice field. It was one of Spurrier’s classic motivational ploys and the next day Clowney was back at practice. On a hot humid night against North Carolina, Clowney had a very average night with only 3 tackles and zero sacks. Questions were raised about whether it was lack of conditioning or his shoulder that was bothering him. Against Georgia in game two, Clowney did get one sack but also had only 3 tackles. In his defense, Georgia spent most of the night running away from him. If you look at Clowney’s stats, he has 6 tackles and 1 sack in two games. He had the same exact stats a year ago after two games. He has plenty of time to get things going, but it does make you wonder if NFL teams will question his motor. I wonder if he isn’t trying to take things easy and trying to keep from getting injured so he cashes in on his big payday. I think once he gets NFL caliber coaching, the sky is the limit for him. After two games, Louisville quarterback Teddy Bridgewater is Clowney’s main competition for the top overall spot. So far Louisville hasn’t faced a tough challenge, but Teddy Ballgame leads the country with 9 touchdown passes against only 1 interception while completing almost 77% of his passes. He is an NFL-ready quarterback that could probably start for some NFL teams right now. Bridgewater is a junior, but he is beginning his third year as a starter. He is a tough, poised pocket passer that makes quick reads and distributes the ball to the right receiver. 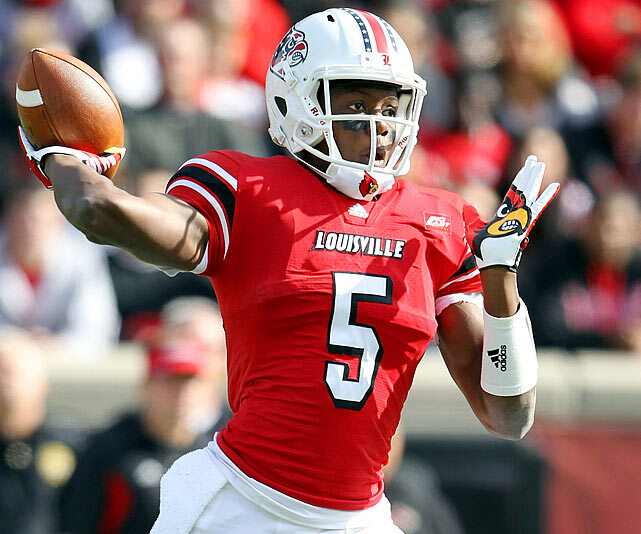 Bridgewater is the real deal and should have no problem being the top quarterback selected, but will he be the first overall selection? To answer that question, we need to figure out who will get the first pick. Yes, it’s early, but it looks like the top two picks could go to the Jacksonville Jaguars and Oakland Raiders. If Jacksonville ends up with the top pick, I don’t think they could pass up the franchise QB. Right now they have Blaine Gabbert and Chad Henne at signal caller. Gabbert is a former #1 pick, but he has not panned out. Henne is a decent backup, but he is not who you want to be the face of your franchise. While it may be hard to pass up on a physical freak like Clowney, the Jags would almost have to go with the quarterback. Attendance in Jacksonville has not been good, and a new quarterback would be a shot in the arm that the franchise needs. There is nothing like a new quarterback to create a buzz around a team. If Oakland ends up with the top pick, the big question is where they think Terrelle Pryor is in his development. If they are comfortable with his development, they may decide to go for the defensive end. The Raiders starting defensive ends are Lamarr Houston and Jason Hunter. A defensive end that can increase their sack totals would be a good way to go for them. Of course over the next 14 weeks, another team could end up “earning” the #1 overall pick. It will be up to each team to evaluate their needs and determine which player best fits their team. I really don’t think you can go wrong either way. This entry was posted on September 12, 2013 by draftmaniacs in Uncategorized and tagged 2014 NFL draft, Jacksonville Jaguars, Jadeveon Clowney, NFL, NFL Draft, Oakland Raiders, Teddy Bridgewater.